Cher Car Kennels - What is a Blue Shepherd? What is a "Blue" Shepherd? What is a "Blue" German Shepherd, Dutch Shepherd or Malinois? Blue, as a color, occurs in just about every breed, and especially in the herding breeds. 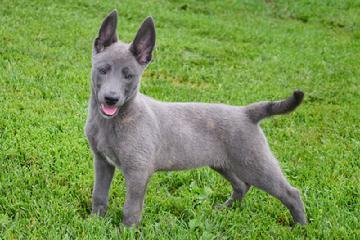 Great Danes, Collies, Dobermans, and of course, German Shepherd, Malinois, and Dutch Shepherds all can have blue pups. Blue is considered to be a dilution gene, actually named an "allele", that is found naturally. Both parents have to have this allele in their genes to be able to produce a blue puppy. The blue pup will be blue, or gun metal gray, where another pup would be black. 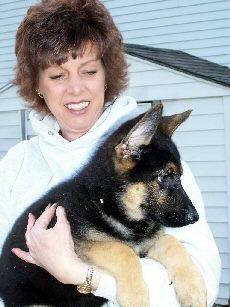 In my German Shepherds, I've had blue "black and tans", blue sables, and blue blacks. Blue puppies are very attractive.. with light "baby blue" eyes, and stand out in any litter. However, when adult, it can be very hard to tell the difference between a blue and another colored dog in the German Shepherd and Belgian Malinois breed. 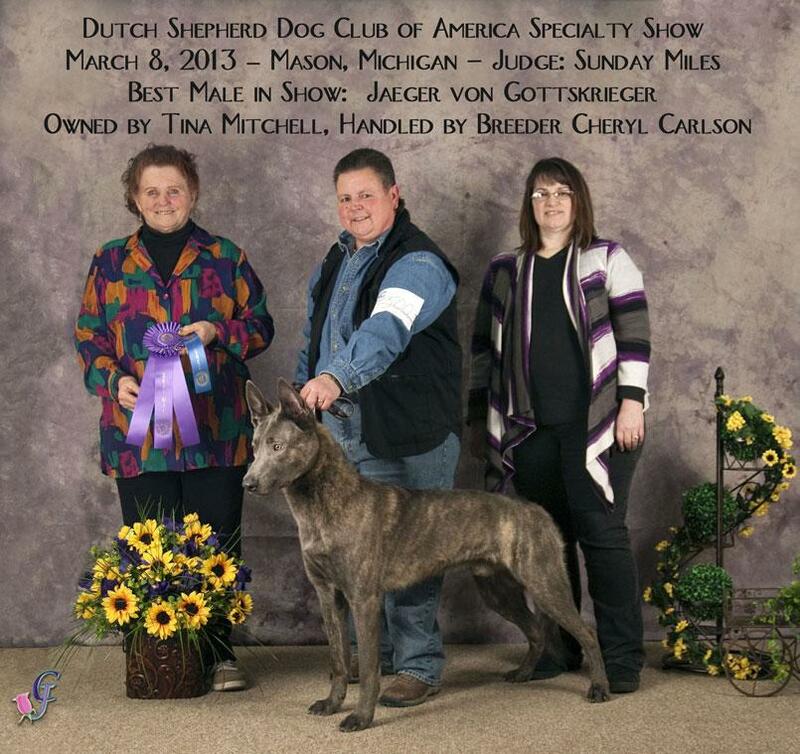 The blue Dutch Shepherd is much more noticable. These dogs are as healthy and long lived as any of my dogs. 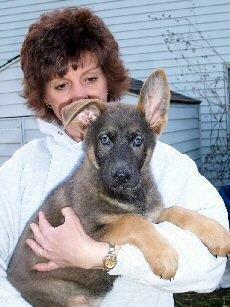 The two photos immediately below show two German Shepherd littermates. These pups are out of P1 Cher Car's A Shout in the Woods X Cher Car's Hey Jude. Both are female. The blue puppy is a blue sable, while the other pup is a traditional black and tan. 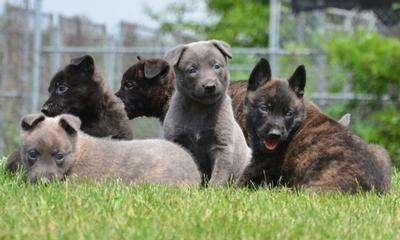 The following photos are of Dutch Shepherd puppies and show both gold brindle and blue brindle coats. 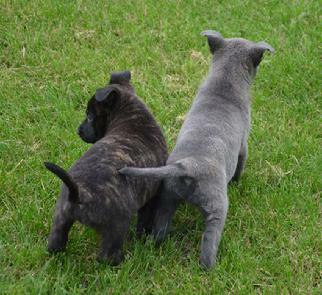 The Dutch Shepherd blue brindle coat coloring can be just as striking as the gold brindle. 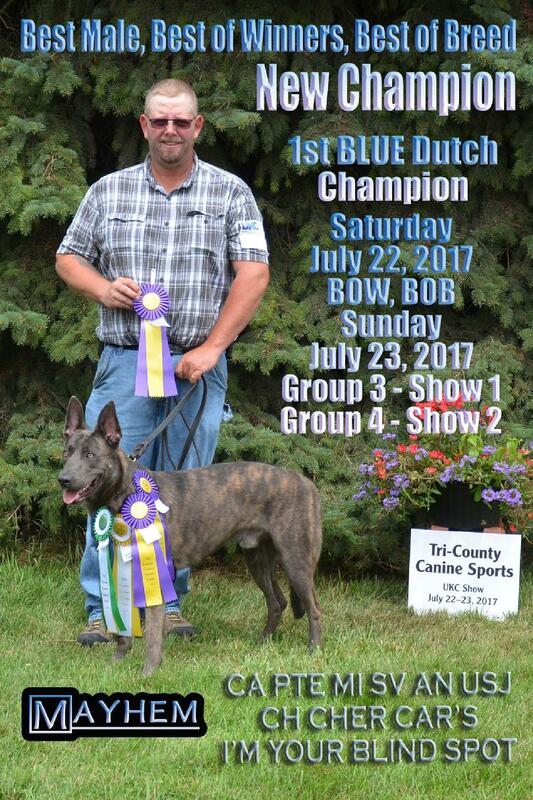 The UKC breed standard (the Dutch Shepherd is not an AKC breed) calls for coat colorings of "Brindle, on either brown or gray ground", so the blue (which is really gray) is acceptable in conformation showing. 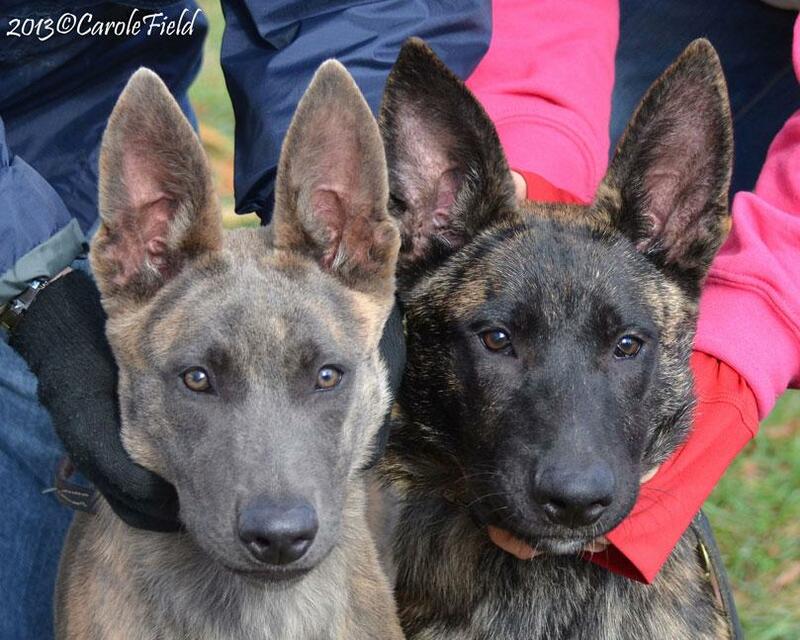 This photo is of three month old Dutch Shepherd litter mates. 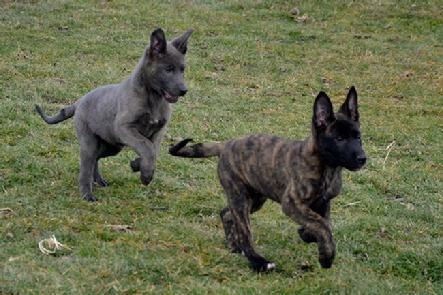 Blues do indeed pop up in certain lines, and determining color in a Dutch Shepherd is like guessing what color eggs will be in your Easter Basket� it is near impossible - especially since their colors continue to develop even after 2 years of age. Cher Car Kennels concentrates on health, intelligence and temperament in our Dutch Shepherd breeding program, with color being the LEAST important. This 9 month old male Dutch Shepherd pictured above will continue to develop more and more brindling as he ages. An unbelievably RARE collection of THREE blue dogs; a blue German Shepherd, a blue Belgian Malinois and a blue Dutch Shepherd. Notice the gun metal blue color on their lips, nose and muzzles. A mix of blue dogs with their tradionally colored counterparts. 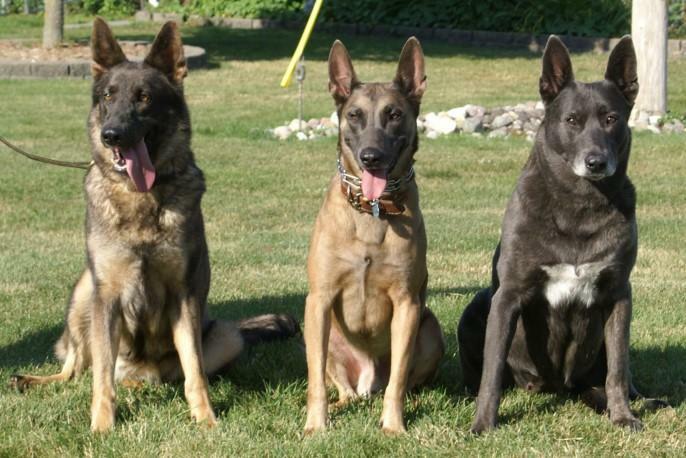 Here we have a blue German Shepherd, a blue Belgian Malinois, a tradional fawn Belgian Malinois with black mask, a blue Dutch Shepherd and a tradional black & tan German Shepherd.